‘More time and money should be invested in developing forms of contraception to be taken by men’. Many people take one form or another of hormonal contraception for years and experience few, if any, bothersome side effects. For others, however, the side effects can be devastating or even life-changing. And despite advances in recent years, information, resources, and awareness of women’s experiences using contraception in the UK are in many respects inadequate. 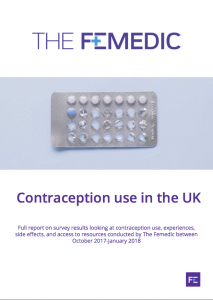 To gauge the nation’s attitudes to contraception, and to find out where, specifically, they feel under-informed, The Femedic decided to ask women about the issues The Femedic felt are most pressing: what type of contraception women are using, how much information they felt they were given about that contraception prior to taking it, whether or not they had issues while using it, how much support they were given from healthcare professionals when they encountered problems, and what changes they believe need to occur to make choosing and using contraception easier. While some of the results were unsurprising, the survey revealed some stand-out issues that clearly need addressing, particularly pertaining to information given prior to choosing contraception, and to the attitudes and actions of healthcare professionals when it comes to supporting women through their reproductive lives. The Femedic asked women where specifically they felt under-informed, overlooked, and what changes they wanted to see in making it easier to choose, and use, contraception. Questions included how doctors and other healthcare professionals (HCPs) acted or reacted when approached for help and advice, whether women ever felt any pressure from partners, doctors, or other to use a certain form of contraception, and what women’s experiences of accessing contraception were like. The survey ran from October 2017-January 2018. It found that risks were not being properly explained to those wishing to use contraception, and as one respondent of the survey pointed out, a one-size-fits-all approach can be extremely damaging. Some respondents also felt that they were not taken seriously by their GP, suggesting that because their GP had seen others happy with one particular form of contraception it should work that way for everyone. Worryingly, nearly half (46.8 per cent) of respondents reported having had “serious trouble” with their current, or a previous, form of contraception. Examples of “serious trouble” included constant bleeding, blood clots, stomach problems, mood swings, acne, post tubal ligation syndrome, persistent thrush, UTIs, breast pain, ruptured uterus, pregnancy, liver damage, vomiting, migraines, and deep vein thrombosis (DVT). 14.7 per cent of respondents reported experiencing “constant” bleeding on their current, or a previous, form of contraception, and nearly one in ten (9.7 per cent) respondents were diagnosed with depression or another mental illness after starting their current, or a previous, form of contraception. Of the respondents who did end up having “serious trouble”, 15.6 per cent said they didn’t receive adequate professional care regarding the trouble, suggesting that many women feel brushed off when they attempt to attribute symptoms they are experiencing to the contraception they are taking. And nearly all respondents to the survey (94.2 per cent) said they feel that more time and money should be invested in developing forms of contraception to be taken by men. Many sexual health clinics are being forced to close due to budget cuts beneath austerity, meaning that the burden on GPs to provide adequate contraceptive care will be even greater. More money needs to be invested into improving sexual health services and keeping clinics open, and more time needs to be spent on creating suitable informational resources for users of contraception. Finally, more time and money needs to be invested in developing newer forms of contraception for women, and forms of contraception for men, so that the burden, and years wasted trying to find something suitable, doesn’t always fall on women.